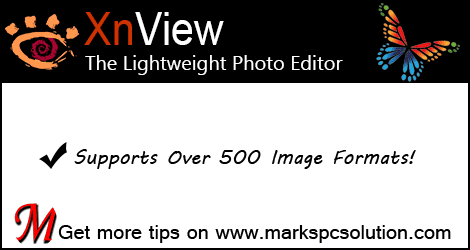 XnView is lightweight photo editor by which you can view, edit and convert your photos and images. Though very small in size, XnView is a powerful image editor and supports over 500 image formats! It's really a handy tool for those users who are not comfortable with Adobe Photoshop. You know Adobe Photoshop is the universally accepted tool for working with photos and images. But most of the users are not comfortable with Photoshop as it's somewhat complicated. As there are numerous image editing options available on Photoshop, it's really difficult to work on it without proper guidance. If you are not capable of working in Photoshop, there are many other tools which you can use to process your images. If you just need to re-size or convert your images, you can use Free Image Converter. I will share the portable version of XnView with you. So you just need to download and install it once. And save the installation file in a safe location. Then you will never need to install it again! Download XnView Portable. It's a zipped folder and only 4.45 MB in size. Unzip the folder and double click on XnView Portable 2.25.exe to begin setup. Choose a location to install the software. Don't use C:/ drive. Because you can use it always even when you re-install your Windows. Open your installation folder and make a shortcut of XnViewPortable.exe on your desktop or taskbar for quick access. 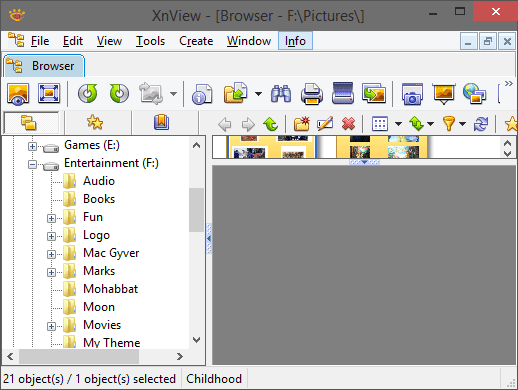 Run XnView from your PC and you will get the list of your folders at the left. Click on those folders and XnView will automatically detect images from there. You will have both Menu and Toolbar to work with. Choose an image to start working. You will notice a change in the Menus after choosing the image. You will have Image and Filter menu after selecting an image. On Filter Menu, you will get some amazing effects same as Adobe Photoshop. From the Image menu, you can adjust your image (Brightness, Contrast, Color Level), resize, rotate, convert etc. Also try the toolbar icons. There you will get many handy tools i.e red eye removal tool, scan, print, save, rotate, flip, zoom etc. You can save your picture in lots of formats some of which are not available even on Photoshop. In only 4.5 MB, you get a lot of things. I hope you will like the tool. Just give it a try . . . I'm a Photoshop CS2 user but i feel that that is going to be too much for the old lappy to cope with (even though i'll get a bit more ram). Can this tool do crop/resize (std stuff)on my mac better than macphun im using now? Google Docs - Manage your Documents Online . . .
Able2Extract - The PDF Manager . . .
Beginning of the End of Internet Explorer . . .
Browser Review - A look back to 2014 . . .